There are many different puzzles of this type in the collection. Some are based on a player's mathematical abilities while others only require "lateral thinking". Some of these puzzles require nothing more than a pencil and a piece of paper, while others make use of very specialized equipment. This page contains some examples from the collection. Requiring only three pieces, and the player's powers of observation, this is a clever bilingual optical puzzle. When a player looks at the printed pictures, 15 Leprechauns are viewed. While they all look somewhat alike, each one has some features which make each one look different. When the 3 pieces are rearranged, one of the leprechauns disappears, and only 14 are seen. The puzzle asks the player "Which one vanishes? Where does he go? When he comes back, where has he been?" 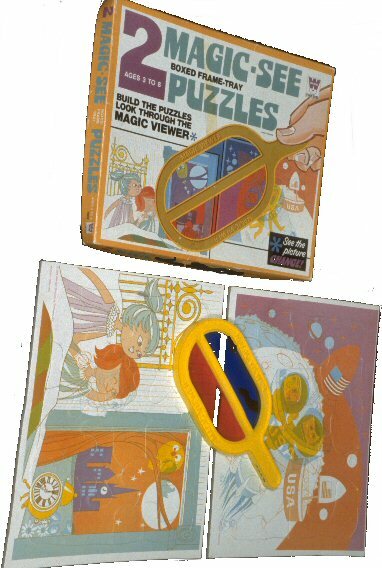 Optical puzzles such as this one are designed for young children who do not yet understand the nature of the "magic" used. Donated to the Museum in 1981, each of the picture cards (bottom of the photograph on the right) have been printed in a number of colors. However, when the "Magic Wand" is used to look at the pictures, they appear to change from what one sees with the "naked eye". Some Website viewers might remember using temporary spectacles with one red lens and one green or blue lens to view a motion picture in the mid-20th century. Using such spectacles tricked the eyes into thinking that the motion picture not only had height and width, but also had depth. The Magic See Puzzles appear to work the same way. The different colored lenses of the "wand" trick the eyes by highlighting or changing certain colors in the picture. The caricatures on the left of Burt Renyolds and Clint Eastwood concerns their 1984 film "City Heat". The drawing was created by Al Hirschfeld and appeared with a revue of the film in The New York Times and elsewhere. For many years Hirschfeld drew caricatures of personalities from the arts, culture, and politics which were used to accompany articles about these personalities. However, almost all of these caricatures where also optical puzzles. David Leopold wrote: "Almost everyone knows that Al Hirschfeld hid his daughter's name, Nina, in the designs of his drawings." To announce the birth of his daughter in 1945, he hid the name in one of his caricatures. Like many other reader's of newspapers, Museum personnel have collected many of these Hirschfeld drawings over the years. The one at the left includes 3 Ninas. Leopold wrote: "Over the years Hirschfeld tried to end what he called 'a national insanity.' But he said, 'I learned, the hard way, to put Nina's name in the drawing before I proudly display my own signature.' In the summer of 1960 Arthur Hays Sulzberger, the publisher of The New York Times, received a letter suggesting that Hirschfeld let readers know how many Ninas they should look for in his drawings. Hirschfeld responded by including a number next to his name for the number of Ninas to be found in a drawing. When there is no number, it means there is only one Nina." To view many more of Hirschfeld's drawings: Hirschfeld Gallery. Use your back button to return to this page. This game, according to the developer Layman E. Allen, Professor of Law, University of Michigan, is designed to offer players an opportunity to increase their ability in "abstract reasoning" and "precise thinking". Play is dependent upon symbolic logic, the rules of inference, logical proof, and formal systems. There are a number of levels of play in this game, and Professor Allen indicates that beginning games can be mastered by young children. The game is intended for two or more players. CLICK HERE for more detailed information prepared by the game's developer. The game pictured in the photograph on the right was donated to the Museum in 1980. It was manufactured by Creative Publications in Palo Alto, California (US) about 1970. The deck consists of 54 cards, each 8.9cm long x 5.7cm wide. The back of each card is pictured at the lower right. 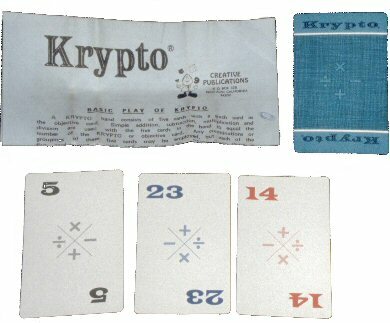 As can be seen, each card features arabic numbers and a set of basic arithmetic symbols. The printed page at the top of the photograph provide detailed instructions in the English language, as to how the game is played. The game is for 2 players. Each player is dealt 5 cards to begin the game, and winning the game is based upon a player's arithmetic abilities. While the game may be viewed as a recreational activity, it lends itself to educational settings in which mathematical games are often used for teaching purposes. This puzzle is dependent upon the shape of a Hexagon and the ability to add. Based on a much older puzzle, in this contemporary version, there are 19 6-sided cardboard figures 4.3cm long x 5cm wide. The intent is to build larger hexagons in which the totals of the adjacent pieces always equals a specified sum. In this instance the sum must equal 38. An example is shown next to the title tag. Acquired by the Museum in 1972, the puzzle was manufactured by the ABC Game Company, Denver, Colorado. The maker at the time enclosed the blue note which says if the player cannot complete the puzzle, he should send 10 cents in coin to cover the cost of handling, and ABC will send the player a number of solutions. 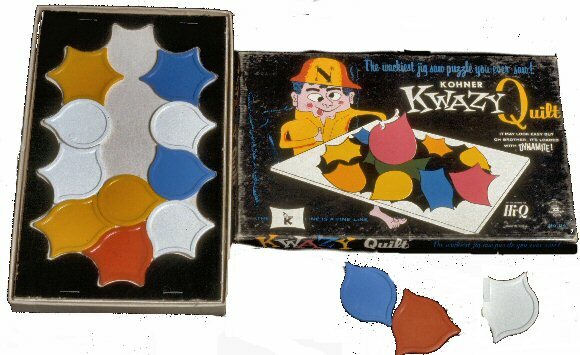 A puzzle by Kohner Bros, Inc. based upon shapes. Pieter van Delft (pages 28-33) offers a number of examples of similar colorful wooden puzzles in which a large shape is cut into a number of odd pieces with the possibility of recreating different shapes by using the pieces in different configurations. The pieces in this copy of the puzzle are made of plastic. Each piece has a number of indentations into which the other pieces can fit. The object is to use all of the pieces in creating different configurations. Another type of logic puzzle is typified by Master Mind. This is a boxed version of a range of printed or pencil and paper puzzles known as "Codebreaker Puzzles". In these types of puzzles, a coded message is displayed, and a puzzler attempts to "uncode" the message. 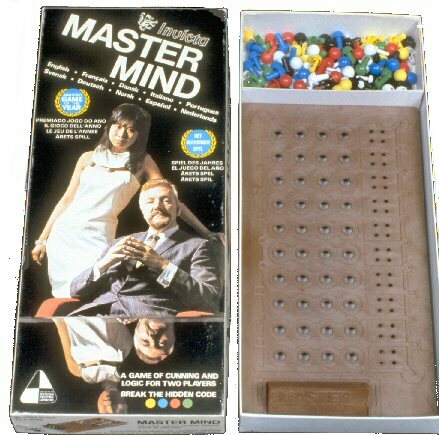 Master Mind has been designed for two players, one sets the code, and the other attempts to determine what is the code. In this instance, the code is made up of a sequence of colored pegs rather than alphabetical letters, numbers, or shapes. This copy of the boxed game in the collection was donated in 1981. It was manufactured by Invicta Plastics, Ltd., Leicester, England. 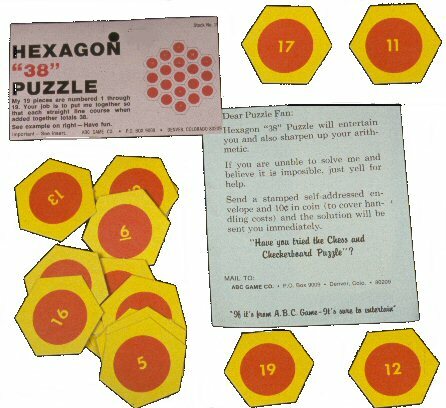 The puzzle was intended for sale around the world as evidenced by the instructions printed in 10 languages. The game board (on the right of the photograph) is 24.2cm long x 12.5cm wide x 1.4cm thick. The pegs are about 1cm in diameter, with a knob at the top of each. This version came with 180 pegs, 30 of each color - white, black, green, yellow, red, or blue. Donated to the Museum in 2004, Tricky Triangle is one of a series puzzles based upon use of shapes in a pattern or code. The puzzle involves a number of differently colored circles joined together in tandem. According to the publisher, the intent is to use these tandem circles to form a triangle, so that no two circles of the same color in the same line of the triangle - vertically, horizontally, or diagonally. 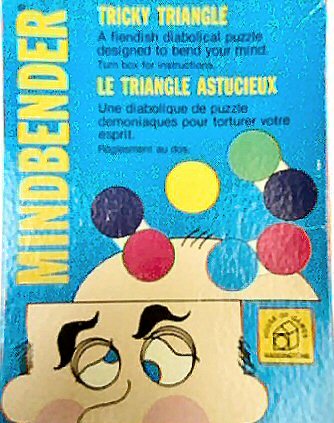 Originally published in Leeds, England in 1969 by John Waddington, Ltd., there are 6 "Mindbender" puzzles - "Perfect Square" - "Tricky Triangle" - "Perfect Circle" - "The Wobbly Web" - "The Path" - "The Perplexing Pyramid". The Museum copies were published as bilingual editions in 1971 in Canada by House of Games Corporation Limited, Bramalea, Ontario.